Nathalie Jacob held a high-level job as a marketing executive and was starting to think about starting a family with her husband when she received some shocking news from her doctor: She had a brain tumor the size of a golf ball and would need invasive surgery to remove it. When she woke up in the hospital, Nathalie was partially blind, she couldn’t read or write, and the only number she recognized was eight. In today’s Mom Talk, Nathalie shares her incredible story, and explains how becoming a mother helped her rediscover and redefine herself after such a life-altering experience. 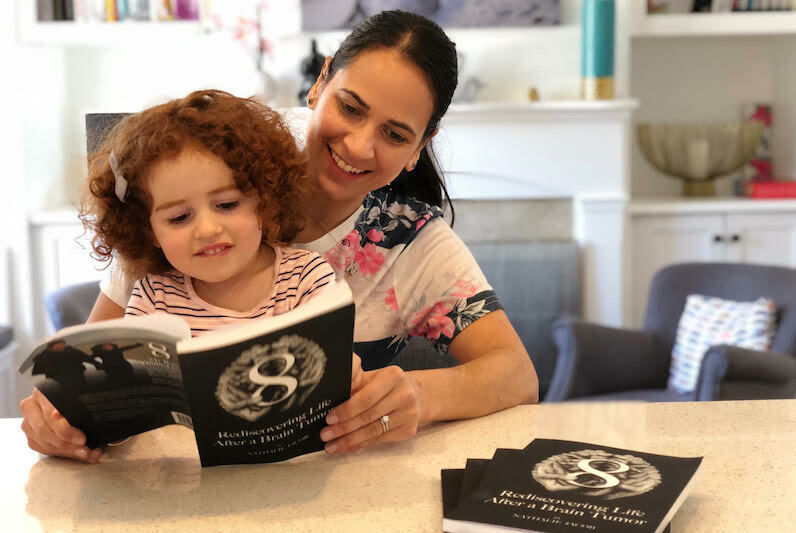 She’s the author of the new book 8-Rediscovering Life After a Brain Tumor. Happily married and thriving as a high-level marketing executive, I was finally ready to start a family. I knew I wanted to be a mom, but the strong maternal instinct that I saw in many other women had never really kicked in for me. I knew I wanted to be a working mom, not a stay-at-home mom. I was 34 when we decided to stop taking birth control pills and allow nature to take its course. Little did I know, life had a different plan for me. Around this time, I went on a ski trip with some work colleagues. The first day skiing I fell quite hard on the icy slope. I even broke my ski goggles! In pain, and with a self-taped, bruised finger I decided not to ruin my vacation and continue skiing. Once I was back home, I went to the emergency care center and told them what happened. I didn’t lose consciousness, so they didn’t take an MRI and told me there was probably nothing to worry about. The following week I caught the flu. But after I recovered, I was left with a terrible headache. I started to get concerned that maybe we missed something from the fall after all, so I went back to the emergency care center. This time they took a CT scan. The doctor reviewed the results. He told me that there was no injury from the fall, “but you do have something there.” He told me to make an appointment with a neurosurgeon. Still, I wasn’t too worried about my diagnosis. I was told that the surgery would take as little as two hours and the only possible side effect was a two percent chance of losing my peripheral eyesight. The estimated recovery was only three weeks. After working for so many years nonstop, having a bit of time off didn’t sound like a bad idea! I’d catch up on all the series I hadn’t watched! That was my first and last appointment with my neurosurgeon. Two weeks later I had brain surgery. When I woke up in the hospital, I was partially blind. I couldn’t read or write in any of the three languages I speak. The only number I recognized was eight. Everything was an “8.” They asked me to write my name, and I drew a circle. My husband and family where shocked. I, on the other hand, was having a blast! I couldn’t stop laughing. I found my condition hilarious, as I thought it was only temporary. I enjoyed every moment. I was too dumb to realize the gravity of the situation. It took years of therapy to learn how to read, write, and add again. My 34-year-old brain became so simple, I was like a toddler. People would visit me, and I would be coloring for hours. That was the only thing I could do and enjoy. I couldn’t even watch T.V., as the stories were too advanced for my brain to understand (so much for catching up on those series!). I couldn’t do any of the simple tasks I took for granted prior to the surgery. My friends would text me and I couldn’t read the messages. I couldn’t read medication instructions, so I couldn’t be responsible for taking my own pills. I had to be taken care of 24/7 for months. Four months after the surgery, I lost my job, as I was clearly not regaining my former IQ. My eyesight wasn’t coming back either. But I never stopped being resilient and thinking positive. Being strong and relentless was the only way I was going to get better. I had hours of therapy at my house and at the hospital. Hours became months, and months became years before I learned how to read, write, and add again. My husband’s job relocated us to Connecticut, where I took more IQ tests. My IQ, which prior to the surgery was above average, consistently tested below average for 6 months, then one year, and finally two years after the surgery. I realized that my career was over. That’s when we decided to resurrect the dream of having a family. Three months later, I was pregnant! We were so happy! I was expecting a baby girl, and I was going to be a mom! Not the working mom I had once imagined myself, but a stay-at-home mom. Nothing about my life looked like it had two short years ago. This got me thinking—who am I going to be? The woman my daughter will know as her mother is going to be such a different person than I ever imagined. Everything that once defined me, no longer is. 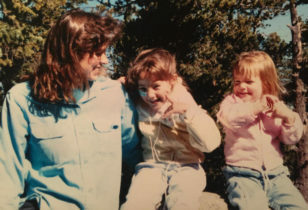 I decided to write a book for her, to share my life story—my past life, the Nathalie before a brain tumor—so she could get to know more about her mom. My daughter Nicole was born in 2016. 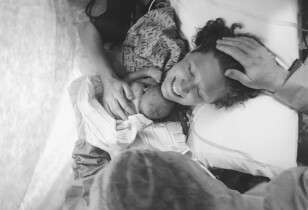 The day of her birth is the day I finally understood the connection between motherhood and instinct. That maternal instinct I thought I never had flooded my heart in a huge wave the moment I saw her for the first time. I couldn’t stop crying tears of happiness and joy. I had so much love! All I could think about was being with her every moment, and that no one could ever separate us. But my brain tumor wasn’t done with me yet. A hospital social worker had heard that I had had a brain tumor and short-term memory issues, and came to my hospital room to see me. She determined that I should not be left alone with my baby for her first year of her life. I was in shock, and that shock quickly turned to panic. Never! What was going to happen when my husband’s paternity leave ended? When my husband had to travel for work? I was disabled and couldn’t afford a full-time sitter! This social worker had made a decision that stripped me of my right to be alone with my baby. I was devastated and furious. The first two weeks after birth, instead of enjoying my newborn, and recovering from the physical pain, the lack of sleep, and the crazy hormones, I had to dedicate my time to going from doctor to doctor, getting everyone who had seen me through my recovery to write letters refuting the social worker’s decision. After a month of fighting, I managed to get all the evidence I needed to prove that I could be left alone with my baby. I finally had the right to be a normal mom. I still miss work. I miss the old me sometimes, but being a mom has completely changed my goals in life. My new dream is to help others. I began by focusing on moms, creating a community intended to build great friendships and support networks. I now run a Facebook group in my town called “Westport Stay-at-Home Moms” where moms can get together for playdates and moms’ nights out, and find other opportunities to support each other. I also created a group to support brain tumor survivors and another to help women in town advertise their businesses. But above all, I know I need to prioritize my little one. As an aftereffect of the tumor, I suffer brain fatigue and low energy, and so I’m limited in my activity and have to rest frequently in order to be able to function and be there for my little Nicole. I have no doubt that being a mother has made me a better person. Life is full of unexpected surprises. We all have the power to take these surprises and convert them into experiences that bring us new happiness and different horizons that we may have never dreamed of for ourselves. For me, that’s meant becoming an author. My unexpected journey inspired me to write my book, 8-Rediscovering Life After a Brain Tumor. We all must reinvent ourselves at different moments in our lives. Whether it’s facing down something tragic and unexpected, like the brain tumor, or simply experiencing a major life change, like becoming a mother, learning from the challenges life throws at us and standing back up as a better, more mature, and considerate person is vital. 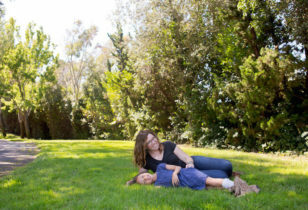 Being disabled and a brain tumor survivor has given me the gift of being a stay-at-home mom to my little Nicole. Being a mom has brought me the purest friendships, the purest love, and the deepest and most genuine happiness ever. It’s been the greatest most unexpected gift I could have ever imagined.